I’ve traveled by myself plenty of times. My first solo trip was at age 10 when I flew halfway across the country to visit family. I don’t remember feeling nervous or scared. Rather, I remember basking in the glow of something I now, 30 years later, have grown to crave: independence. Many more solo trips followed, from college athletic recruiting trips to business trips to postdivorce trips as a Solo Mom when my kids were with their father. But the common thread was that someone, whether family, friends, or coworkers, was waiting for me at the other end. Turks and Caicos was different. 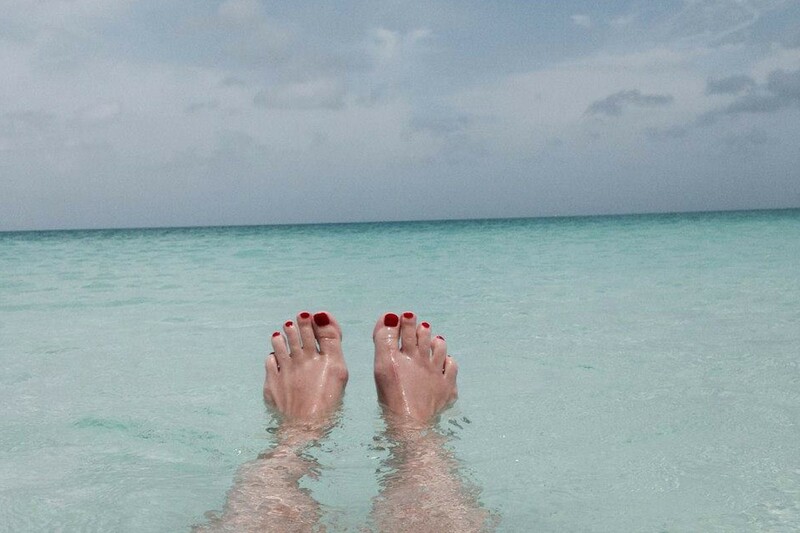 I used to joke that I wanted to disappear to Turks and Caicos, a location I chose simply because I liked saying it. As I anticipated a summer of involuntary freedom while my children spent the summer with their father overseas, I blurted out to a friend, “I’m going to Turks and Caicos.” This time I realized I wasn’t joking. I started researching the islands the next day. Even as my father dropped me off at the airport, leaving me with his guitar strapped to my back and my passport in hand, I didn’t believe I was actually going on vacation alone. Similar to my skydiving adventure two months earlier when the plane ascended to 14,000 feet, I was suddenly shocked that I had turned a bucket-list item into reality. This was happening. I was going to Turks and Caicos for a week by myself. No one was waiting for me on the other end. If I had been craving independence, I was getting it. I couldn’t spot a single person waiting at the departure gate who was traveling alone. I saw excited couples and families, some in large groups that included three generations. I wondered what I was thinking. Why was I going to this paradise with no one to share the experience with? But I knew why. And I was reminded of the reasons when I ran into a woman in one of those large family groups in the restroom. I laughed and shook my head, explaining that I was traveling alone, that after my divorce I decided to embark on a bucket list of things I’ve always wanted to do, such as learn how to play the guitar, go skydiving, and go to a Caribbean island by myself. She responded like most people, including my old predivorced self: “I wish I could check things off my bucket list.” Then she said she liked my pink hair—another bucket-list check—and joined the other members of her family, none of whom seemed particularly thrilled about vacationing together. On the plane, I made a list of things I didn’t want to pass the week without doing. My primary goal was to find a balance among relaxation, adventure, and productivity and go home satisfied in all areas. But more than anything, I wanted to prove I could spend an entire week by myself. I had no kids to feed, no dog to walk, no deadlines to meet, no obligations other than simply existing. And I was determined to exist to the fullest. During the next seven days, I did everything on my list. I lounged on Grace Bay Beach and read Kerouac’s On the Road, charting my own journey in the front cover while digging my toes in the sand. I ate local cuisine, explored on a rented bicycle, watched sunsets, snorkeled, paddleboarded, sailed, walked miles collecting shells, swam buoy-to-buoy laps in the clearest water I’ve ever seen, shopped for souvenirs. I penned journal entries on the patio of the inn I booked because it was off the beaten path. I didn’t rent a car. I didn’t get bored. I didn’t get lonely. I didn’t leave any stones unturned. I didn’t waste a second. During my first of two snorkeling excursions, the boat crew retrieved a couple dozen conch shells, one for each party. After the captain counted the shells, he realized we had one extra. He handed it to a teenage boy and explained his tradition of tossing it back into the ocean. “There is so much in life to celebrate,” he said. “Who came to Turks and Caicos to celebrate?” Hands raised. “Honeymoon?” he suggested. A few hands. The captain looked around for more contributions. “Divorce!” I called out. Some passengers chuckled. Others nodded as if they knew exactly why a divorce was deserving of a getaway. But it was true. I was there to celebrate my divorce. The newness of my split had long worn off, but I was celebrating the path my divorce had created for me. It was no longer something to mourn. Somewhere along the way, it transformed into a celebration of a new life and a rejuvenation of spirit. On the count of three, the boy threw the conch into the ocean. I exhaled, unaware that I had been holding my breath. It was as if the old me was being released and was sinking to the bottom of the ocean along with that conch shell, a sort of burial at sea. I learned many lessons from the old me, but this trip was about moving on, about shedding my baggage and completing the metamorphosis into the person I wanted to be from now on. Ultimately, that’s what this trip was about. Without knowing it, the ceremonious tossing of the conch was exactly what I had been seeking. I planned on being a recluse in Turks and Caicos, allowing my introverted side to dominate my vacation, but I surprised myself by talking to strangers, absorbing their history and what brought them to the same corner of the world at the same time as me. On the other hand, I discovered how comfortable I was being alone. A year earlier, I could barely stomach the thought of simply dining out by myself. But I didn’t think twice about doing everything alone for an entire week. I enjoyed my own company. I didn’t feel conspicuously unaccompanied as I feared. I felt empowered. Strong. Motivated. Happy. Fiercely independent. At peace. When I got back on the plane to go home, it was that sense of inner peace I vowed to bring back with me. As I snapped photos from the sky of the swirls of blue and green water I had only hours earlier been swimming in, I thought about my reflective walks down the beach, the blazing red sunsets, and the overall thrill of doing something I never imagined I would have the courage to do. I held tight to that peace, securing it in a vault for future use, knowing I would need it when the stresses of the real world got me down. As the captain of the snorkeling trip reminded me, there is so much in life to celebrate. And as I completed my journey of self-discovery in Turks and Caicos, I celebrated the new independent woman I had become since my divorce. Maybe she was there all along. But this time, I’m not letting her get away. Heather Sweeney is a freelance writer and blogger, an associate editor at Military.com, a mother of two, an avid runner, and a former military spouse. She has a master’s degree in elementary education and blogs about her life after divorce at Riding the Roller Coaster. You can follow her on Twitter at @WriterSweeney.